INDIANAPOLIS — Lions general manager Martin Mayhew will be meeting with Brandon Pettigrew’s agent this weekend at the NFL Combine. The Lions are looking to extend Ndamukong Suh to clear cap space, but the fact that is not done yet is not a factor in signing Pettigrew. “That’s not a concern at all in terms of getting something done with (Pettigrew),’’ Mayhew said. 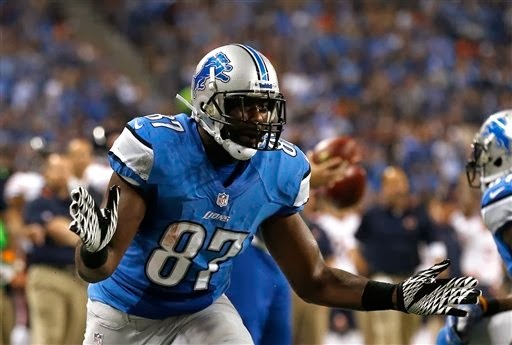 The Lions could give Pettigrew the franchise tag, but Mayhew was noncommital on that. “You never know how things are going to go,’’ Mayhew said. Pettigrew, a first-round pick in 2009, played in 14 games last season and finished with 41 catches for 416 yards. While tight end Joe Fauria had a good rookie season, he is not the all-around tight end that Pettigrew is just yet. Fauria needs to improve his blocking skills. The Lions drafted tight end Michael Williams in 2013, but he missed his rookie season with a hand injury. He remind me of Ryan Raburn. Tons of potential, none of it realized. Much like Raburn, I think he needs a change of scenery. Ryan Rayburn...? Too much credit, more like Kwame Brown or Kilpatrick for that matter... !!! The best of the worst...!